Crying and evolution: Why do we shed tears? 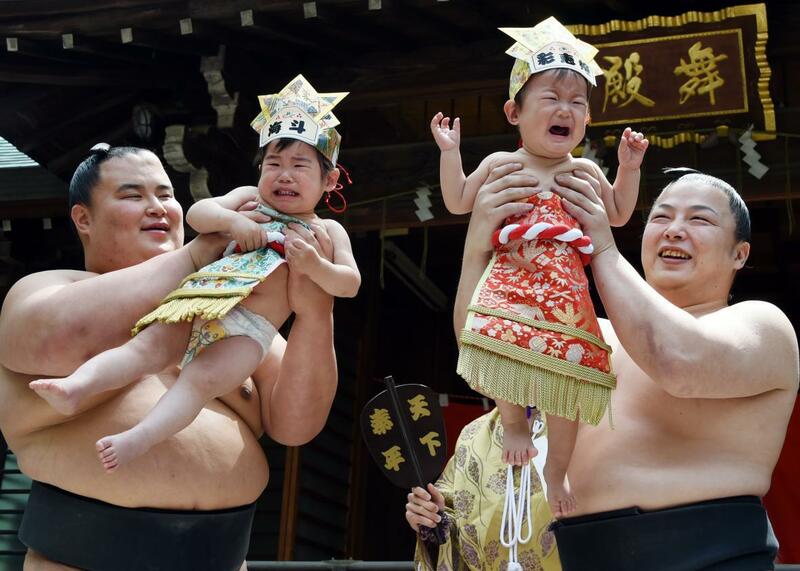 Sumo wrestlers hold up crying babies during a “Baby-Cry Sumo” event in Tokyo on April 29, 2015. Japanese parents believe that sumo wrestlers can help make babies cry out a wish to grow up with good health. Research suggests we don’t weep because we are upset (like we might run because we are afraid); we cry tears to get over being upset. First of all, there’s nothing uniquely human about emotional crying. If you pick up a very young kitten, it will set to the same sort of noisy unhappiness a human baby will exhibit. Other animals can whimper, howl, or wail and do so for the same sorts of emotions that cause us to cry. The difference is they do it dry-eyed. The first crying that babies do is exactly like the crying of other animals—which is to say it’s an instinctual way to signal separation and distress. In fact, babies born with anencephaly—without the majority of the human brain, the cerebral hemispheres—still can and do cry at birth. Continuous or basal tears have three levels: a nutrient-rich mucous that sticks to the eyeball; a watery in-between layer; and a thin veneer of antioxidant vitamin, mineral, and essential fatty acid–rich oil. These are produced constantly for protection and maintenance. Reflex tears contain antibodies, immunoglobulins, and lysozymes to target micro-organisms. They’re caused by exposure of nerve endings in the eye, nose, and face to light, cold, wind, foreign bodies, or irritating gases and liquids. Reflex tears (caused by irritation) are not regular tears in greater quantity—they are biologically different. Induced tears, an allergically or chemically mediated response. Psychogenic tears or tears of emotion, which are unique to humans. Before the age of 3 months, human infants don’t shed emotional tears when they cry. Starting at between 3 months to 6 month of age, human babies begin to shed emotional tears. This is the age where they begin to recognize, respond to, and imitate specific faces—where they begin to become social. There is evidence that one of the functions of tears is to communicate and perhaps chemically manipulate the people around you. This damp skill is probably the result of a genetic mutation for our species. Apparently, what happened is the emotional centers of the brain (the frontal lobe, basal ganglia, thalamus, and hypothalamus) hijacked the sensory circuits used by reflex tears and began to interact with them based on emotions rather than wind or dust. The lacrimal gland is able to secrete proteins by two different processes, each of which is regulated differently. In the first process, known as constitutive secretion, the proteins are synthesized in the endoplasmic reticulum, modified in the Golgi apparatus, and sorted into secretory vesicles. These vesicles immediately fuse with the apical membrane. These vesicles are not stored; thus, regulation of constitutive secretion occurs at the level of protein synthesis. An example of a constitutively secreted protein is SIgA. The second type of secretion is called regulated protein secretion. In this type of secretion, the proteins are synthesized in the endoplasmic reticulum, modified in the Golgi apparatus, and packaged into secretory vesicles. These vesicles are stored until the appropriate stimulus, such as the release of neurotransmitters from nerves, occurs, at which time they fuse with the apical membrane. The whole system remains just outside of conscious control for most of us. The same tears and trembling chin that are conspicuously absent when we are trying to get out of a traffic ticket can capriciously show up during a confrontation at work. Even actors who learn to cry at will typically do it by conjuring up emotional images rather than ordering their face and eyes to perform. This presents a problem for scientists wanting to study “psychogenic tearing,” as well as for those of us who find ourselves dry-eyed at funerals. The culprit is the autonomic nervous system, which controls things like heartbeat and breath and is wired along the blurry edge between body and mind. The autonomic nervous system has one arrangement for speeding things up (the sympathetic system) and another for getting things back to normal when the crisis has passed (the parasympathetic system). The connections with the lacrimal system are shown in this diagram. If we cry because we are upset, in the same way as we run when we are frightened, you would expect the sympathetic system to be involved, but the opposite is true. When someone’s sympathetic system is paralyzed, he or she cries more. On the other hand, if you damage the parasympathetic nerves, you cry less. Remember, the parasympathetic system is there to slow things back down. According to Ad Vingerhoets in his book, Why Only Humans Weep: Unravelling the Mysteries of Tears, many experiments have studied why animals cry out when they suffer separation or pain, but one, a Japanese study in 2008, specifically focused on human tearfulness and the brain. The researchers recorded the activity of the medial prefrontal cortex, while the test subjects bravely watched what was described as a very emotional movie. What they found was three stages subjects passed through as they began to cry: pre-tear, tear-triggering, and the crying stage. As participants emotions were triggered by the film, there was a gradual increase in activity, which transitioned into a spiky increase when the participants began to cry. The researchers wondered if that was happening when the brain switched from sympathetic to parasympathetic activation. Despite the paucity of human crying experiments that focus specifically on tears, this diagram shows the parts of the brain suspected of being involved in the sort of emotional distress that can bring us to tears. In addition to the neurochemicals that cause nerves to fire such as acetylcholine and noradrenaline, there are several neurochemicals that may play a role in the regulation of crying. Serotonin: A single dose of an SSRI like Prozac can reduce crying in both depressed and healthy women. It’s thought that serotonin may influence the threshold for tears. Serotonin is also found in emotional tears. Natural opioids (which used to be called endorphins) are shown to decrease crying, particularly separation-induced crying in young animals. Naltrexone, which blocks opiates (natural or otherwise), increases crying. Prolactin is a hormone released by the pituitary gland and associated with the production of breast milk and about 300 other functions. The lacrimal glands that release tears have receptors for this hormone, which also shows up in emotional tears themselves. Adrenocorticotropin, which triggers emotional tears and emotional sweat, is one of the best-known indicators of stress. Like prolactin it is found in an abundance in tears. Evolutionary Biology: Why are harmful mutations more common than beneficial mutations? Crying: Why do babies cry a lot? Emotions: What does it feel like to be old?